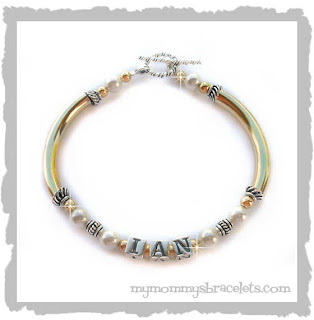 My Mommys Bracelets offers a full selection of handcrafted personalized name bracelets for any Mother, Mommy, Mom, Grandma, Grandmother, Godmother, Baby, Toddler, Bride and more! I also offer matching Mommy and Baby Bracelet sets that are not only for Mothers and Daughters, but also great for Grandmothers and Granddaughters! Don't see exactly what you want? Email me so we can work together to create your "perfect" piece of jewelry that you will treasure for a lifetime. My personalized name bracelets are made using high quality jewelry components. For more information about my Mothers Bracelets (Mommy Bracelets), Baby - Girls Bracelets, Grandmother Bracelets and more, check out About My Jewelry. Together with my partner Ginna from http://www.sassytotsboutique.com/ I have a top 100 site for Mommy and Baby boutiques. These are some of the greatest WAHM (work at home Mom) owned boutiques out there. Before you start shopping check it out... http://shopaholicstopsites.gotop100.com/. You are sure to find a little of everything there! I have added a few Mommy Bracelets, Grandmother Bracelets, and keychains. I am going to be expanding the engravable jewelry section too wth the addition of bangle bracelets in so many different styles for ladies. I will even be adding a few for children. I will also be adding some sterling silver earrings and a few new necklaces. As always, if you have a suggestion for a new product please email me and you never know what you may receive as a "thank you". Things have just been crazy here...so much "stuff" personal and business. I won't bore all of you with it, so I just wanted to pop in and say HELLLLLLLLLO! I am going to be working on a few new things and will get them up on the site soon. Also...here is a coupon! Enjoy 10% off all purchases through June 30th midnight central time. Use coupon code "SUMMER" at checkout to receive your discount. Coupon not valid with any other discount. I am a WAHM to 2 beautiful boys, now 5 years and 2 years. After many years working in a busy hospital as a nurse, becoming a Mom has been the most wonderful "job" I could ask for. After the birth of my first son I quit the daily grind of nursing and turned my focus to jewelry design. All of my designs are created paying careful attention to detail making each and every piece of jewelry you buy a keepsake that can be treasured for many years to come. Visit my sister site www.babygirlbracelets.com and receive 5% off your order by using the code "BLOG" at checkout!